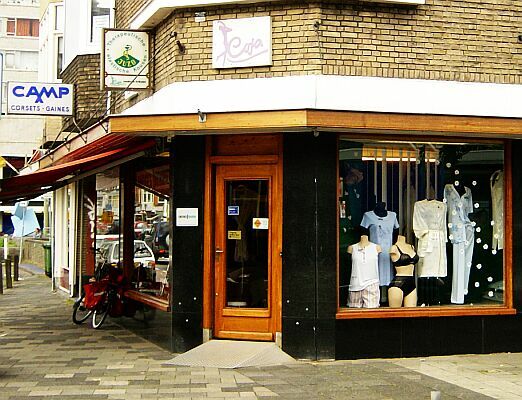 The shop in Rijswijk stills carries, and sells, the modern range of CAMP corsets and appliances . The same family has been running the corset shop Coja for over 45 years. Years ago, there were many such shops spread throughout Holland, now they represent one of the last bastions of traditional corsetry. 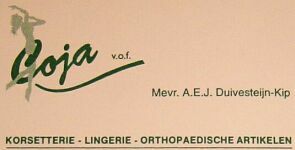 Of course, to survive in this modern world, they have embraced the orthopaedic end of the market, whilst filling their shelf space with brassieres. As the older Mrs. Duivestijn commented “Women still buy traditional corsets, but they are 80 year-olds at least. A generation that grew up with corsets cannot simply abandon them as fashions change”. Mrs. Duivestijn’s daughter now runs the business with her mother as help and advisor for some of the older clientele. The charming pair of corsetieres were amazed that we were interested in the history of their shop, and were only too pleased to pose for a photograph. It was encouraging to see that their shop was quite busy, nevertheless, the mother called over the daughter to talk to us. The smiles that they gave us made our day compete.